You. Me. Ride This Crazy Train - Adventures and Observations on The GO: All aboard the Ghost Train! Friday, March 20, 2015. We arrived at Burlington GO station with plenty of time for the 16:37 train to Union. However, something was amiss. Passengers were milling about gazing at the schedule monitor. The 16:37 had been cancelled. Crap, crap, crap, crap, crap! The earlier train to Aldershot (1) had been cancelled due to a medical emergency. That train normally reverses direction and becomes the Union-bound trip (2) we wanted. 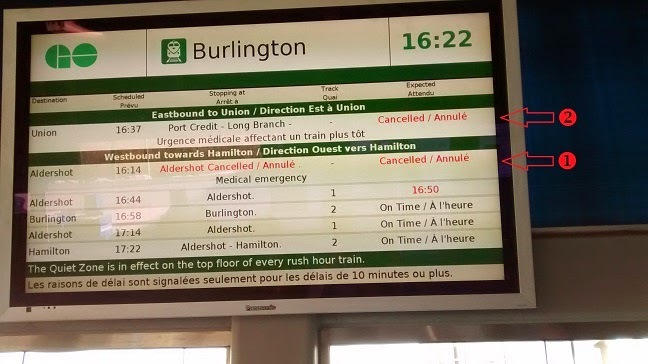 The next scheduled Eastbound train would be the 17:37; there is no 17:07 despite the popular belief the Lakeshore line has all-day, half-hour service. 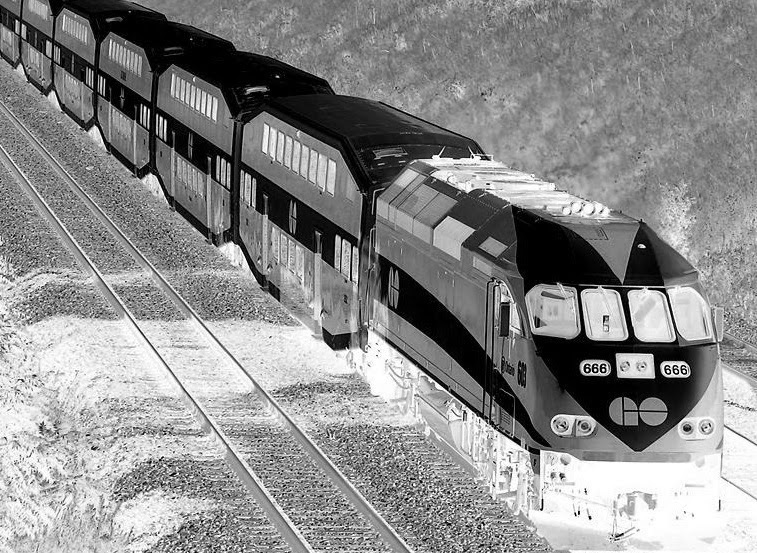 Shortly before 17:00, the station attendant advised passengers that the 17:37 train would be starting its trip early and run all stops to Oshawa – “Please proceed to Track 3.” The train rolled in about fifteen minutes later with locomotive 664. I’m glad it wasn’t 666, because I was in no mood to deal with anyone who was hexakosioihexekontahexaphobic. I had no sooner settled into my seat in the cab car when the CSA announced our train would be all stops to Union. WTH?! It was time for a conversation. I navigated my way from the back of the train to the accessibility coach. I asked our CSA, Katelyn, if she could tell us exactly what was happening at Union station, since we were told something different at Burlington. She radioed for clarification immediately after announcing the five coaches at the west end of the train would not open the doors at Bronte station due to platform restrictions. What else would befall us this trip? I had my answer soon enough. We overshot the platform at Bronte station – by a lot! I was within earshot of our CSA as she stepped onto the platform and informed her colleagues what was required to reverse (re-spot) the train to align with the platform. Her instructions were very clear, but the others didn’t comprehend. It took close to ten minutes to back up the train. In response to my earlier question, Katelyn made the announcement that our train would be out of service at Union station. Passengers wishing to travel east of Union should stay on the platform, as the LSE train would pull in on the same track after this train left. At stops on our trip, passengers had questions about the timing of the train. Katelyn explained patiently that we were not a regularly scheduled train; we were making up for an earlier incident on the LSW. “Exactly what trip is this?” I asked at one point. “It’s trip E921. You won’t find it on any schedule. We’re a ghost train,” she said. We stopped and took in the vista of the freight rail yard in Oakville while we waited for a train to reroute around us. East of Port Credit, we got to sit and wait again. There were times I felt the engineer did get the locomotive out of first gear, but for the most part, we just trundled toward Toronto. As we rolled into Union and the door opened on platform 11, Katelyn pointed to the lighted platform sign and told me the LSE 18:43 would board on platform 13. I thanked her and glanced at my watch as I exited the train. It was 18:41. This ghost train had arrived at Union at the same time as the aforementioned trip that makes the scheduled 17:37 stop at Burlington. The impromptu trip had been a complete waste of money. The rest of the trip went without incident. The only item of interest was a fare inspection at Rouge Hill. I had to laugh. Ain’t that the way it GOes? On Monday, March 23, I fired off this e-mail to Metrolinx. Note how there are no destinations listed in the drop down list on the GO Train Service Guarantee claim form. Ghostly, isn’t it? Was my trip on Friday really a paranormal experience? My PRESTO transaction history indicated it was not. At 10:30 PM on Tuesday, I sent an e-mail to Raymond Bachant, President, Americas Division, Transportation commending our CSA for her exemplary service on Friday. Mr. Bachant responded before 9:00 AM the following morning thanking me for recognizing Katelyn’s excellent work. (C.J. Smith is in receipt of this email). Can we see evidence of this email response from the CEO of Bombardier? Write to Mr. Bachant yourself and ask him to forward the email. This page will assist. There was no e-mail from the CEO of Bombardier. Read the article, again. "Mr. Bachant responded before 9:00 AM the following morning thanking me for recognizing Katelyn’s excellent work. " It was the President, not the CEO (but I knew who Anon meant). Why is it so hard to show the email? It's not. It's also not the point of the story. I'm pretty certain E921 is normally an empty stock move. Soooo... I'm Katelyn! The CSA on E921. TomW you are correct. We would usually have been out of service, and heading back to the yard (Canpa/Mimico). And..... Mr. Bachant recognized my performance, he forwarded the original email to my bosses and supervisors. Thank you for the appreciation. And sorry about our Ghostly ride! Gotta love my Lakeshore passengers! Chris texted me to tell you he gave you a copy of the letter today. I'm so happy to hear Mr. Bachant shares the letter with your superiors. Thank you for taking the time to comment. I really appreciate it. It would have been a more gostly story if the writer contacted GO and..."there is no Katelyn working for GO".